Forza Horizon 4’s latest update has removed two recognisable dance emotes, previously labeled in-game as ‘Floss’ and ‘Carlton.’ Fortnite maker Epic has recently been sued over both of those dances, though neither Microsoft or developer Playground Games have offered any official comment about why those dances were removed. Instead, the removal of the dances comes buried at the bottom of latest update notes without any explanation on why. Fresh Prince star Alfonso Ribeiro sued Epic last month over the ‘Fresh’ dance in Fortnite, which was even more explicitly named in Forza as the ‘Carlton.’ Similarly, Backpack Kid started another Fortnite lawsuit over Flossing. Those suits were both filed by Pierce Bainbridge Beck Price & Hecht LLP, and further suits over the same dances were brought against 2K Games, specifically for the use of those moves in the NBA 2K series. We’ve not heard word of any similar suits against Microsoft. We have reached out to the company for clarification on why the dances were removed, but did not receive an immediate response. 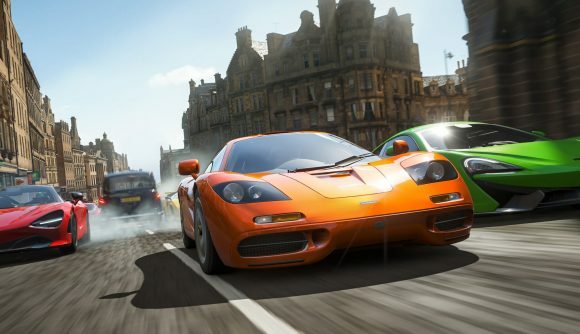 You can read the Forza Horizon 4 patch notes for yourself at the official site, as brought to our attention by VG247. Both dances are simply gone from the list of selectable emotes, though you can see what they looked like via the video below. These aren’t the only recognisable dances in Forza – you’ll find a reasonable facsimile of Drake’s Hotline Bling moves, for example – but they are the only ones being removed, and the only ones that are the subject of ongoing litigation. The latest dance lawsuit concerns Orange Shirt Kid concerns Orange Justice in Fortnite, so it seems we’ve not yet come to the end of this sort of litigation. Exactly how all these dance lawsuits go remains to be seen.